Recently the popular science press has heralded the discovery of a legendary Viking Sunstone. The sunstone is mentioned a few times in Medieval Icelandic literature, where it was claimed that it could be used to determine the position of the sun on cloudy days, and even at twilight after the sun has set. Not being an archeologist, I can’t comment on whether such a stone was used by the Vikings, but being an astrophysicist, I can say it was possible. Sunlight, like all electromagnetic radiation, is a type of wave known as a transverse wave. Basically this means the wave oscillates perpendicular to its direction of travel. If you shake a rope to make a wave, you get the basic idea. The rope moves up and down, but the wave travels along the rope. Since the oscillation is perpendicular to the motion, the wave can have an orientation known as polarization. For example, if you shake a wave up and down, you get one polarization, and if you shake it left and right, you get a different polarization. In general, sunlight doesn’t have any particular orientation. The light waves are all random, or unpolarized. But when sunlight reaches our atmosphere the way it scatters off the air molecules depends on its polarization. Certain polarizations are scattered toward the Earth, while other polarizations are scattered away from us. As a result, the light of the blue sky is polarized relative to the position of the sun. Light scattered from clouds is basically unpolarized, but some of the polarized light from the blue sky still makes it through the clouds, so sky light is a bit polarized even on cloudy days. Since the polarization depends on the position of the sun, if you can measure the polarization of sky light, you can determine the position of the sun. That might seem quite a challenge for medieval sailors, but it turns out there is actually a type of rock that can be used to view polarized light. It is known as calcite or Iceland spar (seen below). Because of its particular crystalline structure, Iceland spar bends light differently depending on its polarization (that is, different polarizations have different indices of refraction). This means with unpolarized light you get a double image when you look through it. 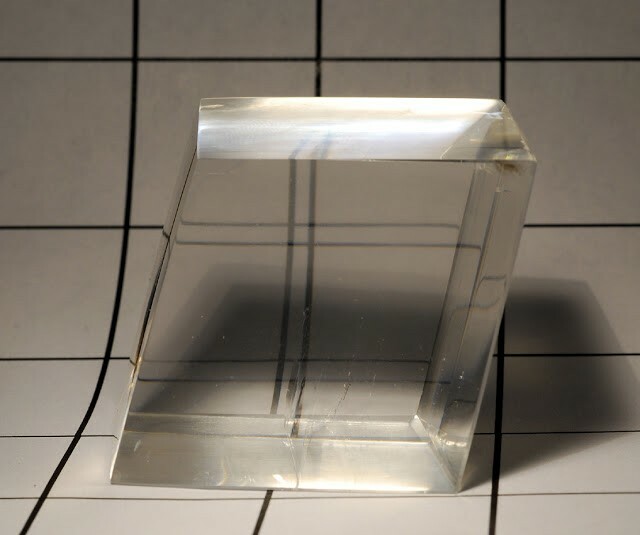 With polarized light, you would see only one image, or one image would be brighter than the other unless you orient the crystal so that the polarized light is halfway between the orientations of the crystal. Since sky light is polarized, you can hold a piece of Iceland spar up to the sky and turn it until the two images are equal. When that happens the crystal is aligned with the orientation of the Sun. If you know what to look for, and have a reasonably clear piece of crystal, then you can determine the orientation of the sun to within a few degrees, which would be pretty good for a Medieval sailor. So it is possible that Medieval sailors could have used such a crystal for navigation. Iceland spar is fairly common in parts of Iceland, so the Vikings could certainly have accessed it. It also seems to match the descriptions of the Viking sunstone pretty well. Of course just because the Vikings could have used a calcite crystal to navigate doesn’t mean they did. I’ll leave that question for the archeologists. 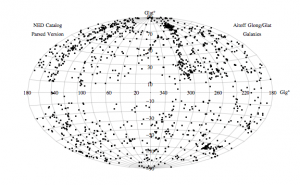 As an interesting side note, polarization is also very useful to modern astronomers. Pulsars, for example, can give off polarized radio waves, and that allows us to determine things such as the magnetic field of our galaxy. But I’ll leave that for another time. Cool!!! But does this have anything else besides rocks that vikings used?? ?